Third in a series of small poems about the relationship between a book and its reader. Each page contains one word; the meaning changes depending upon how the reader groups the words. Set in 18 pt. Garamond Italic and printed both sides on Arches Text Wove. 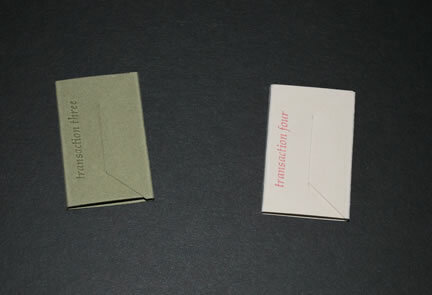 Concertina-folded, in wrapper of Twinrocker paper. Edition 200, $10 plus applicable tax and shipping. $10 plus shipping and tax where applicable. Fourth in a series of small poems about the relationship between a book and its reader. 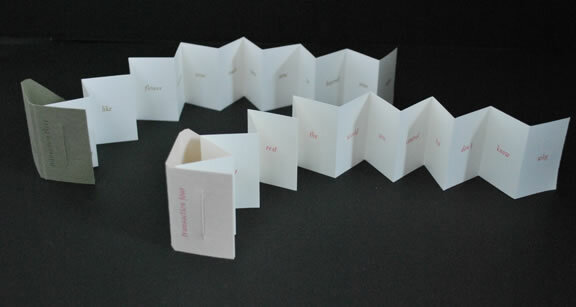 Each page contains one word; the meaning changes depending upon how the reader groups the words.